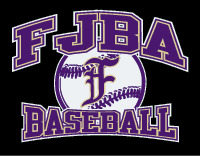 FJBA BASEBALL apparel and accessories are now available to order online! VERY IMPORTANT: ALL ITEMS ARE MADE SPECIAL TO ORDER AND MAY NOT BE RETURNED FOR SIZE EXCHANGE OR FOR REFUND. PLEASE BE SURE TO ORDER THE CORRECT SIZE. There is a sizing chart on the page of each individual item. Please be sure to check that sizing chart before ordering. Some items (but not all items) will be available for viewing at Sports & Apparel. FIRST ORDER DEADLINE IS FEBRUARY 20th. SECOND ORDER DEADLINE IS MARCH 10th. FINAL ORDER DEADLINE IS APRIL 10th. You may customize most items with player name, or name and number at an additional cost. All items available for customization will have a drop down menu on the description page of that item. 1. Select "In Store Pick Up" - When your order is ready, you will be called to pick up your order at our store.